I have limited storage space in my kitchen affecting both my counters and cabinets. I need to combine wherever possible, or I'll soon be crowded out of the room. That's why I really like this combination. With all of the available choices in appliances in general, and coffeemakers in particular, anything a company can add to give their product an edge is a good idea. This product is really three in one: grinder, coffeemaker and carafe. Cuisinart says that ninety-eight percent of your coffee is water. That's why they believe the water should be at its best. Their charcoal water filter removes odors, chlorine, and bad tastes before sending the water through to brew your coffee. The stainless steel thermal carafe keeps coffee warm while overcoming the burned effect that can happen with a glass version. Whether you grind early to have your pot waiting for you first thing (there's an automatic setting for that) or grind as you go, the machine makes the perfect grind for this style of coffee preparation. Every feature of the unit is adjustable, so you can set the unit up to work for you, not against. The design is Italian inspired, very sleek looking. The idea is simply inspired, period. 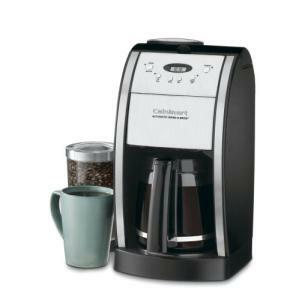 Compare this with the 12-cup Cuisinart Brew Central coffeemaker.